Jonathan Yearsley, from Caergwrle Nr Wrexham in Flintshire, was keen to separate his business activities from his home life but wanted to avoid the need to commute so turned to Deeside-based Rubicon Garden Rooms, which has provided him with the “perfect” solution. 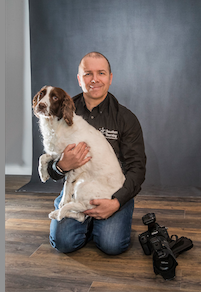 The 46-year-old former IT consultant set up his own company, Jonathan Yearsley Pet and Equine Photography, six years ago after being inspired by his own two spaniels, and now specialises in dog and horse portraits. A former Kennel Club Dog Photographer of the Year, demand for Jonathan’s work is increasing year on year, with some clients travelling across Europe to get him to snap their pet. Jonathan believes moving his base from a loft conversion to an impressive new outside studio will enable him to grow his business further. Dog owner Jonathan, who is originally from Prestatyn, said: “I wanted to separate the house from the business but I desperately wanted to avoid a commute. “What Rubicon Garden Rooms has provided me is absolutely perfect. I basically walk across the front of my garden to get to work. “I’m in now and just need to make a few tweaks to get it ready for the studio sessions. 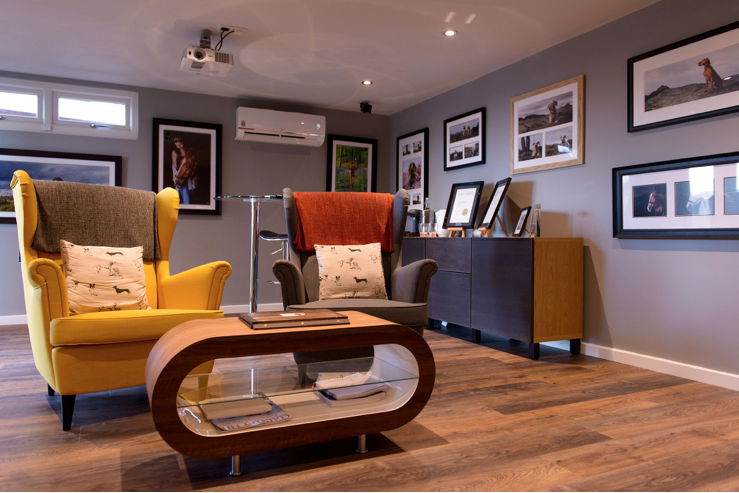 “It’s a brilliant internal space and the fact it’s maintenance-free was the major selling point for me. “I’ve invested money in the studio and I can justify the investment because this is what my business needs to keep growing. Jonathan enjoyed photography during his student life but it wasn’t until he got his two springer spaniels Milly and Daisy that he revisited his old hobby. He said: “I did it for fun as a student and then took it up again nine years ago when we got our dogs. “Like a lot of people I started with wedding photography as I could do it on a part time basis. “I gradually got busier and busier and about five and a half years ago I took redundancy from my full time job. “I got into dog portrait photography after running a competition to support the Dogs Trust. It worked so well and I saw it as a potential market to get into. “It snowballed from there really and quickly overtook wedding photography so I decided to concentrate solely on dog portraits. “I’d never been self employed before becoming a full time photographer but I couldn’t imagine being an employee again. It can prove difficult to get dogs to pose for pictures but Jonathan always has a few tricks under his sleeve. He explained: “I enjoy it, though it can be a challenge. Some dogs are fantastic to work with, some don’t have any skills at all, but the majority are somewhere between. “I allow plenty of time and also do a pre-shoot consultation with clients so I know about a dog’s character and skill sets. “Some will quite happily sit and be photographed but they are few and far between. I can use extendable leads and edit them out, if needs be. “In the worst case scenario a client can hold their dog, or have two people either side of the dog, and then I edit them out. “The dogs can range from three month old puppies to old retired sniffer dogs. I will never force a dog to do something they don’t want to do. He added: “I’ve got to give clients a hands-on experience as they often travel from distances. “We’ll do a shoot in the morning and then they can grab some lunch while I edit the images and then they comes back, look at them and we have the sales session. That way it’s all done on the day. “My clients generally travel from North Wales, Cheshire and Lancashire but I also get them from Scotland and Northern Ireland. Having a Garden Room in Wrexham has been great - I’ve even had people come from southern Spain and Prague to get their dogs photographed. “I’ve found that interest has come from word of mouth and referrals, and Facebook advertising also works very well for me. Rubicon's Managing Director, John Lyon said: “As an animal lover myself it was great to work with Jonathan on this project. “He’s a hugely talented photographer and his business is going from strength to strength. “He wanted something that was maintenance free and value for money, which is exactly what we’ve been able to provide him with. “Mostly customers ask us for wide windows and doors to make the most of the views from their garden room or office, so it made a change to design this studio, which just has an entrance door, and no windows. 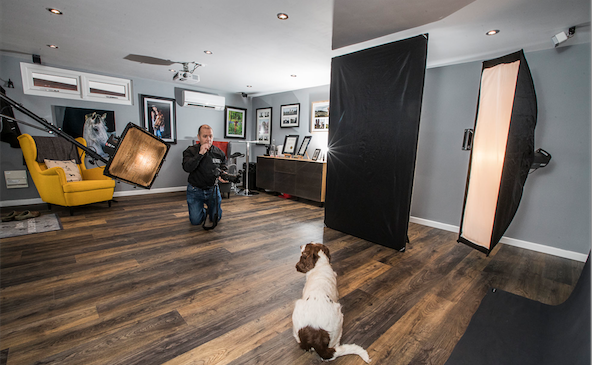 “However, it has provided Jonathan with a very flexible space for his business, with room to sit and chat with customers, take photos for their dogs and then edit the results.